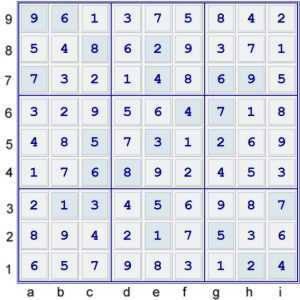 The Tough Sudoku of February 26, 2011 is another potentially instructive Sudoku puzzle. 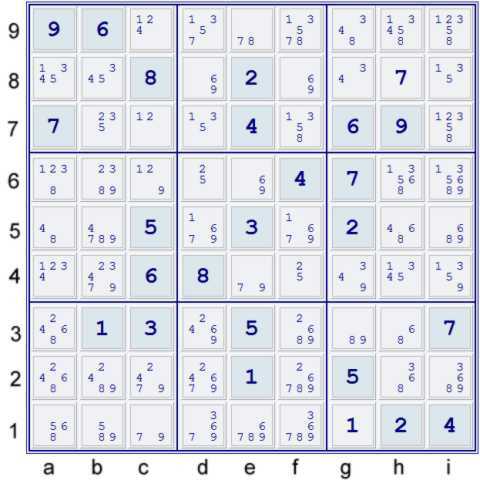 In this particular puzzle, grouping together a single candidate technique as an argument in an AIC can be a nifty Sudoku technique, trick or tip. 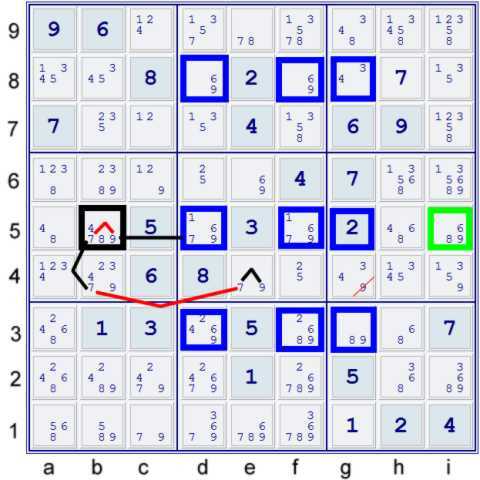 This blog page will spend but scant time with the easier sudoku techniques. 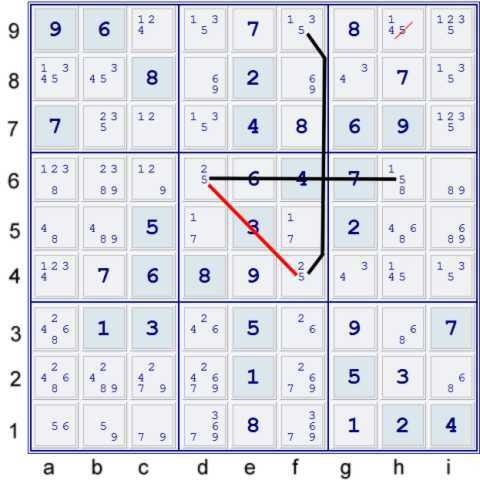 I will not explain most of the steps which are part of the Simple Sudoku Technique Set - SSTS. Although this loop certainly produces some valid eliminations, the step I illustrate below solves one of the SIS' (Strong Inference Sets) used in the loop. When this occurs, the loop becomes superfluous. If it is a bivalue/bilocal loop, each SIS in the loop solves when any SIS in the loop solves. because clearly, at least one of FSF(9)dfg358,i5 OR (9)b5 must be TRUE. The elimination below can be argued without using Locked Sets or Almost Locked Sets, but the manner below minimizes the use of the "=" symbol, which seems to be currently preferred on the tough pages here. 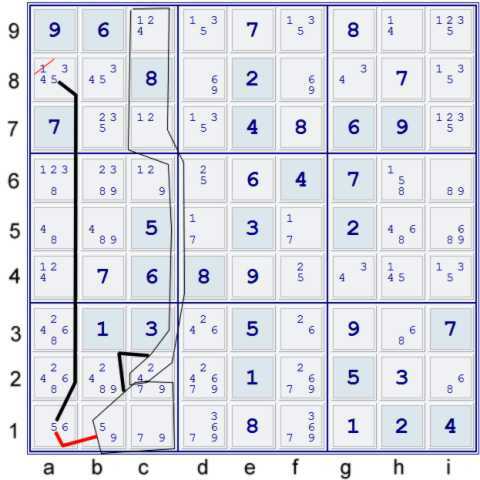 The puzzle is reduced to a cascade of singles until solved. Max AIC Search Depth 2, I believe? This is really something to get the teeth (or in my case tooth!) into. Can you direct me to a link that defines skyscraper (and other more advanced shapes); also a review of finned xwings and other shapes. I know the basics (xwings, swordfish, etc. ), but I can't find the definitions for the more exotic shapes. 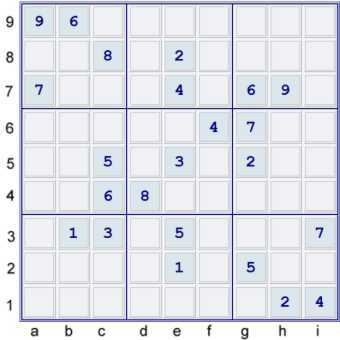 I couldn't find anything in Sudopedia or in the definitions page of Sudoku.Au. Thank you!! Nice work! How about giving us a way to get the puzzle into a solver so we caa follow along with you?